I started DJing with Ableton Live after a couple of decades of playing out on CDJs and 1210s. I also own Traktor Pro 2 and I play out using Serato with vinyl too, so I’m certainly well placed to understand all the ups and downs of Ableton DJing – of which there are many of both! I should also add that for me the glass is always half full, and half the fun of a Scalextric was building the track itself! As the creator of Isotonik and Oktopad, which are software templates for the Akai APC40 and Novation Launchpad respectively that work with Ableton Live via Max4Live, I believe I’ve created two tools that makes DJing with Ableton Live more intuitive and more fun – especially if like most DJs you come from the kind of background above. In this article, I’ll go through some of the philosophy behind my products, and look at specific ways they can help you to tame Ableton Live for DJing. 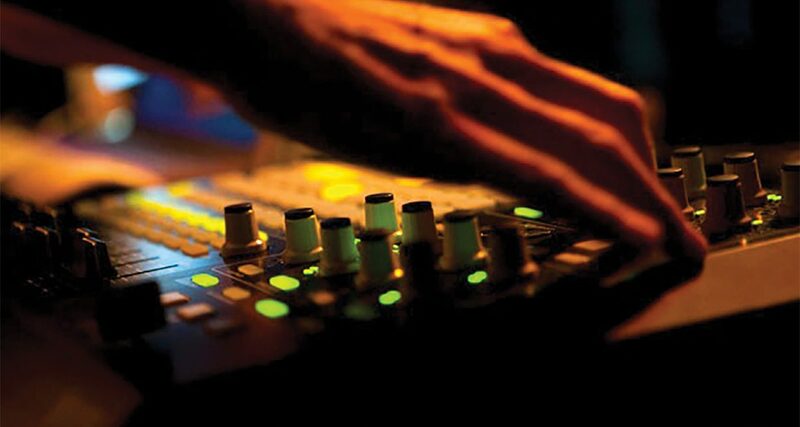 For the traditional DJ, the benefits of Serato and Traktor are many. Personally, I was first attracted to the ability to carry my entire record collection in a single bag (my gym membership lapsed many years ago and my back isn’t what it used to be…). But I also embrace wholeheartedly all the new technology. Looping actions, doubling up tracks at the click of a button, cue-point juggling and bewildering effects can all add to the DJ’s ability to entertain a crowd. Some will use these subtly, while others have created whole genres out of making tracks unrecognisable from their original forms (check out Kutski or Kissy Sell Out on YouTube to hear what I mean). So anyway, if Traktor and Serato can help you to do all of this, why consider Ableton Live in the first place? Serato Scratch Live can give you the real true vinyl feel, while Traktor is a Midi programmer’s dream. Surely between them they are all the digital DJ needs? Well not quite, as it turns out. User configurability – One of Ableton’s most appealing features. For instance, how about being able to create endless effects chains to distort or enhance your audio and possibly even create an effect never heard before? Isotonik in action on the Akai APC40. Matched up with the right controller (buttons are important for triggering tracks, and encoders and faders are necessary for effects, so consider an APC40 or Launchpad / iPad combination; even a couple of Nano-style controllers can give you a full set-up from a backpack) and you can create a truly unique performance. 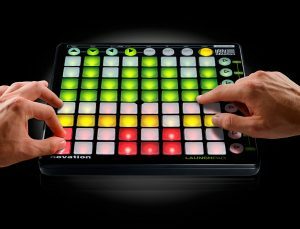 So where does Ableton lose out to its DJ controller and DVS cousins, and how can Max4Live along with my products help reduce that disadvantage? Let’s look at that question. There are two big shortcomings to Ableton that crop up again and again, but both can actually be seen in a positive light. With an Ableton session you first have to “warp” all of the tracks you want to play (think beatgridding in Traktor or Serato). 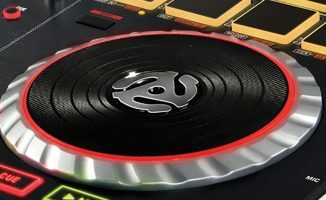 While things got simpler with Live 8’s new warping methodology, some users still complain that this isn’t as automatic as, say, Serato’s system which seems to hit the downbeat each and every time without much effort. However, those of you who have been DJing for a number of years will recognise the benefit of knowing your tracks inside out. Initially the process of warping involves listening to your tracks a number of times, which has to be good for your DJing – and anyway, with a little experience a track can be warped in no more time than it takes to listen to it. No question, Ableton’s browser is currently lacking. It’s small, and slow to respond to search requests. After a night smashing tune after tune out of Serato you’ll yearn for the simplicity of its browser and meta tag searching. Ableton Live’s browser: not its strongest feature for DJs. There are workarounds and some are ingenious in their approach but these feel more like hacks rather than a streamlined integrated solution. So instead many DJs choose to create a large template, containing every tune they think they’re going to be playing! Preparing such a template feels a little bit like packing a crate of tunes for a DJ session. But when you come to think of it, focusing on your set before you turn up (just like vinyl DJs used to when packing a crate for the night) can actually be a very good thing. OK so we’ve coped with the shortcomings, realised the benefits, and we’re ready to start pushing the envelope with our DJing, doing things that leave the Traktor and Serato boys way behind. Here’s where Max4Live along with my software for the APC40 and Novation Launchpad helps you to better use Ableton Live as a DJ. 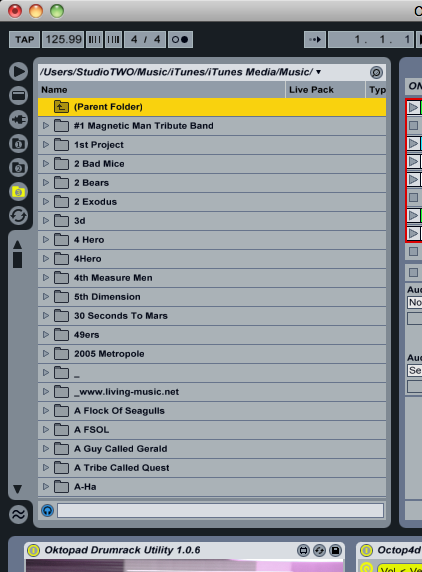 Max for Live is best seen as a toolkit for adding new behaviours to Ableton Live. My procuts – Isotonik and Oktopad – are templates for the Akai APC40 and Novation Launchpad that use this toolkit to put some pretty cool stuff in your hands. Ableton guru Tom Cosm championed what he called his “megaset” DJing principle, where each full track is split into its relevant parts – intro, drums, break, vocal etc. This is a popular way of using Ableton Live for DJing, as you can really get stuck into remixing on the fly, get a visible indication of where you are in a track, and have the ability to create infinite cue points. Although Serato has just upped its game with the ability to name cue points, you’re limited to five in total, and while Traktor Pro 2.5 with the new Kontrol F1 controller again are nodding in Ableton’s direction, we have yet to see how that system will pan out. However, the downside of using Ableton this way comes when triggering the following clip. Currently you can set “follow actions” with Ableton within each clip, choosing from a number of defined actions to occur after a certain number of bars, beats and units from the clip initially started. 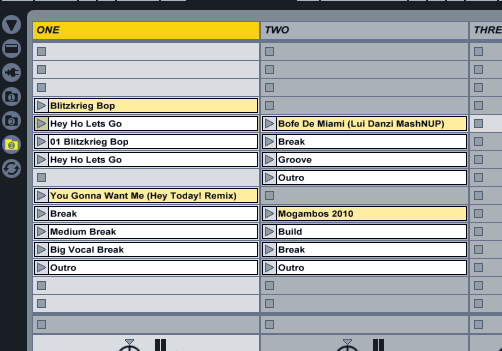 The “megaset” principle of Ableton Live DJing: Lots of tunes ready to play, all pre-assembled. With a little bit of effort this can be done quickly but each clip needs to be set separately and if in the middle of a clip you decide to engage a loop then your follow action will occur at the originally set time regardless of the fact that the clip has not met its end. So here’s where Max4Live comes in. It circumvents this limitation in Ableton, by keeping an eye on where you actually are in a clip no matter what you’re doing and only triggering the next clip when you actually reach the end. No follow actions, no lengthy set up and the ability to perform looping within tracks! Ableton offers a great deal of configurability for Midi Mapping (not as much as Traktor admittedly, but easily equalled when using a third-party utility such as Bomes Midi Translator). However much of what can be mapped relies on what is in focus. For instance, you can map a Midi controller to set a loop start and end point and toggle the loop on and off; however, you can only do this on the clip that’s in focus. therefore to loop a clip, you’d have to navigate to it first, unnecessary mouse-pushing which, in a dark venue and with a glowing screen can lead to that “just checking Facebook” look. Wouldn’t pressing a single button to set a four-bar loop be much more preferable? Again, Max4Live to the rescue! With Max4Live you can send message to hidden parameters. Once you understand the nuances of getting the message order right, it’s ultimately possible to set up on-the-fly looping for the eight tracks within the Novation Launchpad’s Clip Launch rectangle (the 8×8 grid of clips that can be triggered from the pads of the Launchpad), setting loops and halving, doubling and moving them with even more control than either Traktor or Serato. Sometimes no matter how well you warp a clip it’ll just not sit right with another clip’s bassline or hi-hats. On a pair of turntables, jogwheels or touchstrips you’d just give the offending track a little nudge to bring things sonically back into line. Unfortunately, with Ableton it’s not as straightforward. While Ableton has a Midi-mappable set of nudge buttons, but like the looping functionality you can only nudge the clip in focus. Plus, it will also only perform a nudge in the size of the current Global Launch quantize. 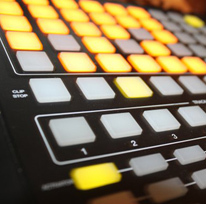 The Launchpad: a perfect pairing for Ableton with an iPad. But once again, Max4Live to the rescue! By sending a simple message to the playing clip with a value of 0.01 you’ll be back to one physical action to achieving the nudging result – just like the + and – buttons on a Denon CD player. Here’s a bonus: Ever started a track a bar too late or early? Well simply ask Max4Live to jump forwards or back a bar! Again, it’s simple, one-click stuff. Many digital musicians love mixing in key, analysing their music files for key and colour coding them in Ableton according to the Camelot wheel for easy harmonic mixing and mashups. Well for them, the ability of Max4Live to be change the pitch of a clip on the fly brings brand new mashup possibilities to the fore, with an endless number of accapellas now becoming suitable to lay over virtually any instrumental. I made Isotonik and Oktopad because I love the creative possibilities of Ableton Live but wanted to address some of these very real concerns that DJs moving across from other systems have with the program. However, it’s not for everyone. Ableton is still a far cry from two-decks-and-a-mixer. Hopefully Max4Live with the APC40 or Launchpad and my templates makes it easier and more fun, but the truth is, you’ll never finish building your source tunes template, and with this and other issues, it’ll own your life, ruin your relationships, and see you end up with friends that you only recognise through their avatar on a forum! I can’t do anything about all of that, I’m afraid – and I can’t bring parallel waveforms back for you, either. Apart from that, though, for the adventurous DJ, Ableton Live plus Max4Live with Isotonik and/or Oktopad, does, in my opinion, present the most powerful DJing platform out there today. • Isotonik and Oktopad are fully featured templates for the Akai APC40 and Launchpad respectively. Subscribers benefit from a steady dream of updates as new functionality is requested and realised. More details and videos can be found at Darren’s website, and subscribers can get involved on his Facebook Page. 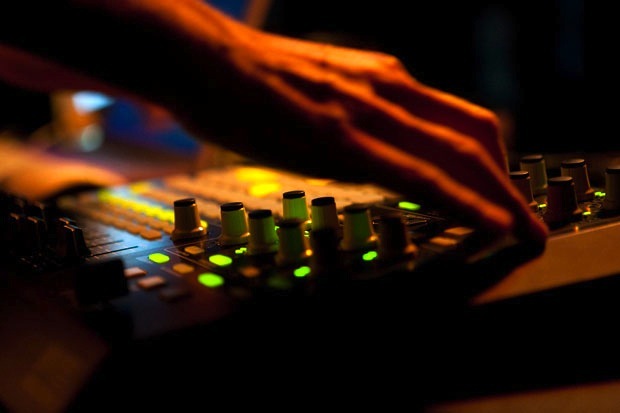 Have you tried or considered Ableton Live DJing? Do you currently DJ with Ableton Live? What are your experiences of Ableton, Max4Live, or Darren’s templates? Please share your thoughts in the comments. 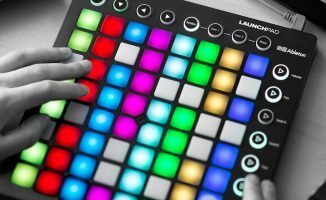 Controller Clinic #7: Novation Twitch or Launchpad? You now can use VST synced with traktor’s bpm and per deck too. Traktor 2.5 (2 decks only) with a DNMC6000. I use Ableton 8.3.3 with a Traktor Audio 10 Soundcard. I use 2 channels on DNMC6000 for Ableton (1 for Audio, 1 for Monitoring). I have Ableton Sync to Traktor 2.5 and controlled by APC40. My operating system is OSX 10.7.4. I will be using Stompy to use Guitar Rig 5 VST for effects with Traktor 2.5. I love the precision I can get out of my effects when djing with ableton. I am hoping bitwig could address this need for a true hybrid of daw and dj software. As much as I love the innovations with software and the work and time that goes into developing the mappings I cant see myself using my eyes more than my ears. my exact feelings as well, performing is as little as watching the screen for me as digging through a record box…. I don’t have an apc. but i have a launchpad and I guess i’m just really disappointed in the mapping capabilities in the standalone software without automap and every other app out there. They’ve got to improve that soon if they want to be taken as a DJ software. If they want to stick to production, they’ve definitely got me as a customer. I’ve repeated many of the concepts in this article to people who ask me how I DJ with Ableton Live. Looks like my desire for Max4Live is surely becoming a need. Better start budgeting! I midi map my stop all clips and the stop transport button to two empty clip slots! Was on stage once with the APC in an awkward position and my hand brushed the transport stop button, went from mashing 4 tracks together to utter silence…. Lesson learnt! I used Ableton Live with the Bridge in Serato and I love it. Can’t Dj with it alone, I do need the feeling of vinyl and an ACTUAL crossfader off my TTM57. My next venture is to integrate The Bridge with Serato Video. I need to beef up the RAM on the computer just a bit, but it will be so worth it. I use ableton with an audio card with 4 sets of stereo outputs. The only internal controls are channel levels within ableton which I try not to move too much. Otherwise, all of my mixing & gain control is on a standard dj mixer. So much possibilities, but lacks the ease and comfort of simple DJing. Performance of a 30 minute set YES. If you get to know those tracks but for all night DJing? No way. I want to be able to pick a song and play. I do not want to spend more time setting warp markers home than I do playing out. For me the setting of warp markers is the same as beatgriding in Traktor no? I hope that we’re just at part one for the Bridge though…. I’ve got a setup that uses the Lemur app to control my clip launching as when combined with the bridge i dont have to use half my serato screen to look at ableton…. Being a DJ who has both used Traktor and Ableton I have found ableton being alot more keyed in. I switched from Traktor to ableton about a year ago. And control my whole set using an APC20. And as for mixing I havent had any trouble if you use the warping of the tracks correctly. 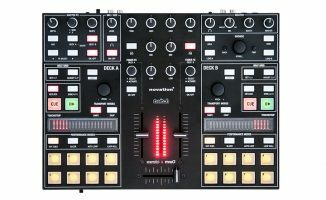 However I cant wait till berrhingers new USB Mixer comes out because I already have a Smart Mixing Mapping planned out. Thus allowing me superb control of 4 decks without the worry of jogwheels and anything else. It was done for MixMeister and Ableton Live, but the procedure is the same for any dj software. I also included links to tutorials made for Traktor and Live specifically, but they are more confusing than mine (I guess). ETbh Everytime I see a dj using ableton I just don’t the same feeling.I respect what they do, but for me there just feels like there’s something missing. for example… I’ve seen sasha dj back in the day and also in period of using abeloton and it just didn’t have the same spirit. now he’s gone back to using cdj’s, he seems back to what he was.. just my opinion though. You can always tell when a “DJ” is using Live… You can hear it… It works sometimes. Sometimes not. I use Live for production way more than I use it in live situations… though I have used it live… I would really like to see an Ableton “Not Live” that was just aimed 100% at production. I’d rather use Traktor or some CDJ’s to drop the tunes I make with Live. Really cool article. Justice are a great example of top notch Ableton DJing. Even back in 2007 for A Cross The Universe they were implementing stems from different tracks all over the place. And it isn’t like they are doing it to be tricky or fancy – it just seems to be the best method for playing out their sounds live in a coherent set (as opposed to being limited to mixing one track into another like “normal”). I freaking love Justice…I need to see their new set this year haha. Saw Digitalism do the same i think and it was pretty inspiring, that said i’ve also seen a few that have simply pressed play on a very eleborate set and havent reached for the headphones once, when it’s not your own material i dont see the point in this…. Got caught out once very early in using it when a previous dj basically played every tune i’d prepared, i now make sure i have a mega set approach with my main cutting up of tracks being limited to acapellas and drum loops…. I have used both Traktor and Ableton Live. I also used controllers for both (Trigger Finger, APC 40, MIDIKeyboard)and the man-in-the-middle Xone X4. At the end, Traktor is for DJing other’s tracks and Ableton is for production and DJing one’s tracks, loops, phrases and samples. Could you please provide a name for the plugin that allows to do this? It would be a real killer feature! I’m kind of fresh with ableton and dj’ing with it but I see a big potential of this setup and I’m thinking about buying APC. Just one (maybe stupid) question – is it possible to hear your track on headphones before you gonna play it to the main out (something like cue in dj mixer) ? Yes, but to do so you’ll need a soundcard with a least two sets of outputs, the Audio DJ2 is a good budget solution! 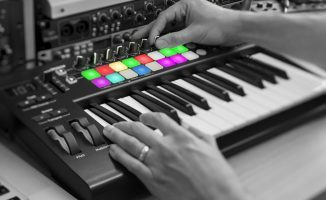 Enjouyed this article would love to see a template like those above but for ableton push for a DJ setup!! You’ll be pleased to hear thats what we’re working on next! Ive been using Ableton for DJing for years, mixture of Touch OSC, Launchpad all hooked through a Xone DB4. Never find a way to control the browser via Midi, anyone know how it can be done? Would love to just be able to open and close it as a minimum. Hey Mike excuse the very novice questions but I just bought an akai mpc40 mk2 and have a laptop with ableton. Just looking at the mpc now I realise it doesn’t have any outputs on it. Obviously I need something between my laptop and a club mixer or any set of speakers. Just not sure what. Would love any advice and refommendations. Only on Launchpad and Launchpad S as stated on the website….